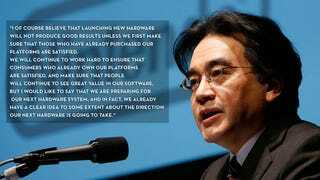 Nintendo chief Satoru Iwata has some thoughts about Nintendo's next hardware—and what it needs to before it moves on. This is from Iwata's most recent Q&A with shareholders and is in light of Nintendo's struggle to make its Wii U console a hit. Photo by Koji Sasahara, AP Images.